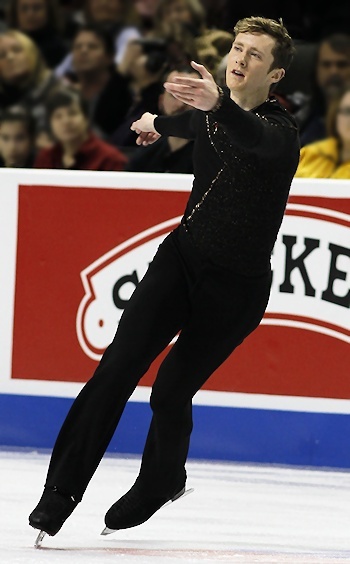 Jeremy Abbott performs to "Exogenesis: Symphony" at the 2012 U.S. Figure Skating Championships. It was a mixed bag for the newly crowned U.S. Men’s champion at the 2012 U.S. Figure Skating Championships. Jeremy Abbott, the 26-year-old from Aspen, Colo., was having perhaps the performance of his life in front of a packed house, while in the stands, his stepfather, Allen Scott, 64, was having a medical emergency. Focused so completely on his performance, the three-time champion missed the melee that was just rows away from the ice. Abbott learned that shorted after his Exogenesis: Symphony program had started, that Scott blacked out and started convulsing. “I spoke with my mom and learned that his heart rate is down and his blood pressure is up. He’s coherent now, and I was able to speak with him,” he said. Abbott reported that at press time there was no further cause for concern. The gold medalist opened his program with a strong statement in the form of a dandy of a quadruple toe loop jump, and captivated the audience with his subtle, yet captivating, choreography. The 2009-10, and now 2012 champion earned the highest score by a man at the U.S. Championships, collecting 273.58 points in the competition. His lone miscue in the program was the doubling of an intended triple Salchow. Abbott was named to the World Team, and will be joined by his training mate, 22-year-old Adam Rippon. Rippon, a pre-competition favorite since he moved up to the senior level for the 2008-09 season, finally made good on all of the promise he has shown by winning the silver medal. This is Rippon’s first medal in four attempts at the U.S. Championships. The silver medalist opened by popping an intended quadruple Salchow into a double, but received credit for six triple jumps in his Air and Toccata & Fugue program. Rippon earned a U.S. Championships career high 240.87 points this week in San Jose. Last year’s bronze medalist, Ross Miner, defended his position on the podium, moving up from fourth after the short program. Miner, who finished with 230.32 points, will join Abbott and Rippon in Colorado Springs in two weeks for the competition. Armin Mahbanoozadeh, 20, finished in fourth place—his highest finish ever at the U.S. Championships since winning the novice title in 2007. Douglas Razzano finished in fifth place, while Steven Carriere finished in sixth place—his best placement since winning the bronze medal in 2008.